It's now 6 months since the county conference launched our Get Women Golfing initiative in Lancashire and we are already seeing lots of really positive activity and results for the clubs who have engaged. We are now repeating some of our well-received workshops to help your club volunteers and executive in developing their skills and in understanding how to use the available research, resources, and techniques to bring new players into the game and members to your club. 6 clubs now have new women's initiatives in place with another 7 in development and already 21 clubs have reported an increase in female membership in 2018. 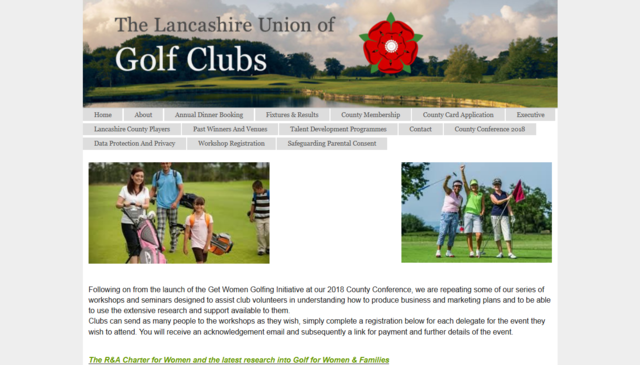 Sign up for the workshops on this link https://www.lancashiregolf.org/workshop_registration and let us help you to improve your business offer and bring in valuable new members. New players who you introduce to the sport will be your most loyal customers rather than moving existing golfers between clubs, they will also add much to the vibrancy and future development of the club. If your club is not already working towards increasing female membership, or you need help with developing your plans, then come along to our workshops and see how we can support you. Dr John Fry of Myerscough College was commissioned by the R&A to bring together the vast amount of research undertaken across the world into women and family participation in golf. His final report formed the supporting evidence for the R&A's new Charter for Women launched earlier this year. John takes this research and explains how it can be used in practical terms to support your club's activities, including marketing and strategies for business development. Delivered in one half-day session on 17th October at Bolton Old Links, this workshop is a complete programme in preparing your club for the future of family sport. The cost of £25 per delegate includes lunch. Each club may send multiple delegates but places are limited so sign up as soon as possible.